Post 3 of the South East Asian Adventure series. View the rest of the series so far here. I’ve loved elephants as far back as I can remember. There’s something about those big flappy ears, curious trunks and plodding feet that I can’t resist, and although they couldn’t look more different to us I see something very human in them too. 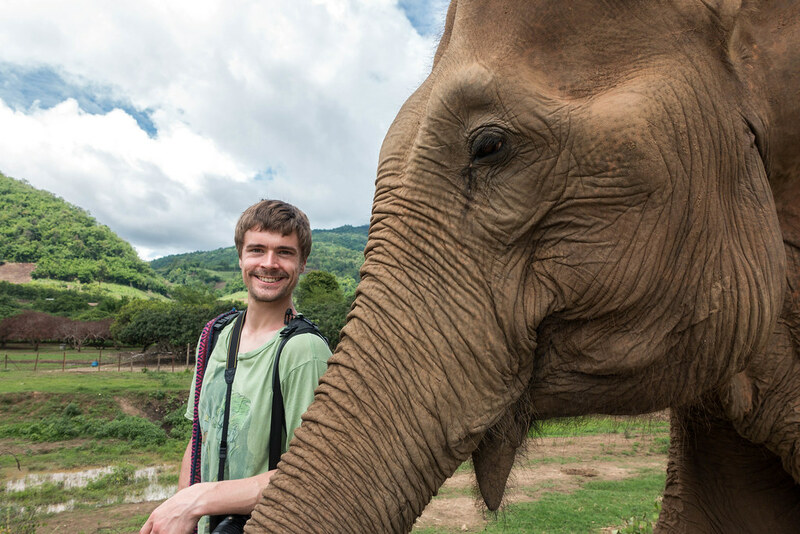 So meeting them up close was a ‘must-do’ in South East Asia – on the condition that they were happy and living as true to their nature as possible. 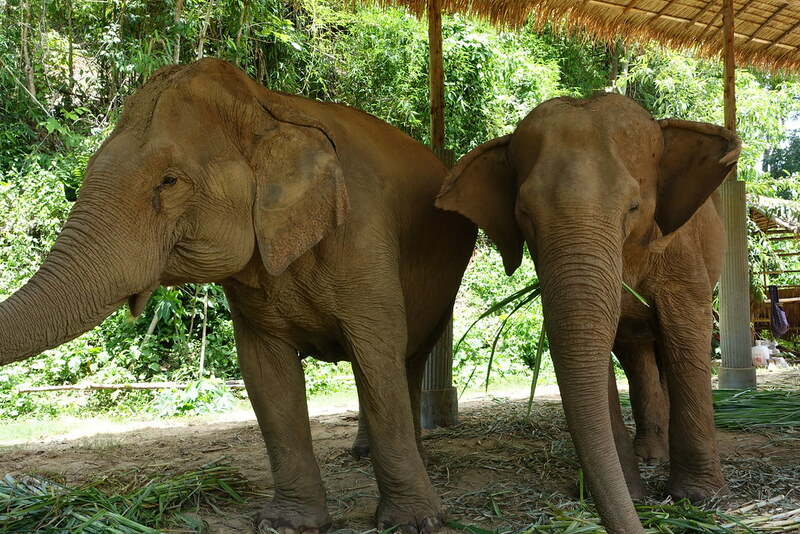 After some research I found Elephant Nature Park (ENP): an organisation that ‘rescued’ elephants from captivity and allowed them to live comfortably in their natural habitat, with no cruel hooks or riding allowed. The one-day experiences it offered were far more expensive than those offered by less ethical organisations, but we knew it would be worth it. In fact, it’s what brought us to Chiang Mai in the first place. 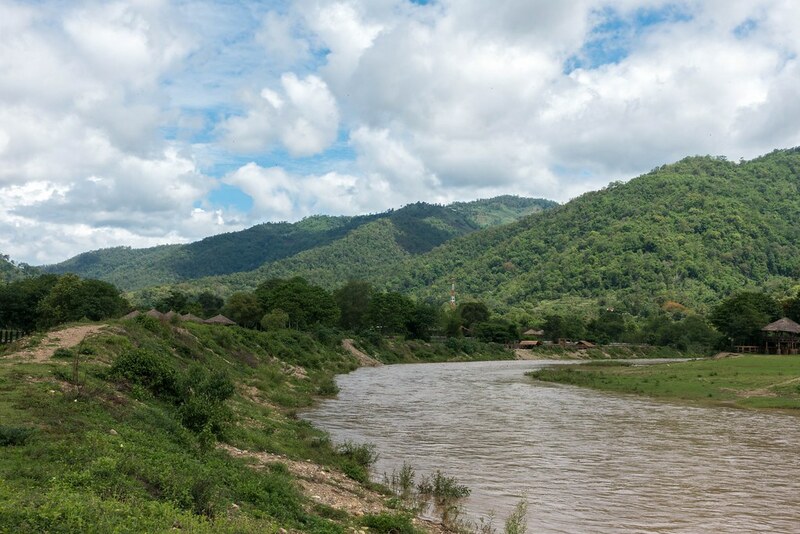 We decided to do the Care for Elephants programme as it seemed to include everything we wanted: feeding, walking through the jungle, a dip in the river, and a trip to Elephant Nature Park itself. Our minibus pick up was scheduled for 8am on our third day in Chiang Mai, so we had to leave before our guesthouse began serving breakfast. Instead we went across the road to Roof 69, where I had a tasty omelette and, much to my delight, some English Breakfast tea (the green teas drank locally were not to my taste!) Rather than having the option of a fry-up, Roof 69’s breakfast menu listed every possible breakfast component, such as ‘sausage’, individually. Steve literally ordered one of everything. The Elephant Nature Park minibus turned up late, and still had to pick up a few more people after us. Once it was full our guide introduced himself and the project, and showed us a video about how elephants are abused by other tourist attractions. We were surprised to see Lou from Neighbours explaining how to interact with elephants safely! As we rolled into the jungle, the excitement in the minibus was palpable. The windows revealed scenes seemingly lifted straight from The Jungle Book, with lush green hills, tropical trees and muddy rivers in abundance. 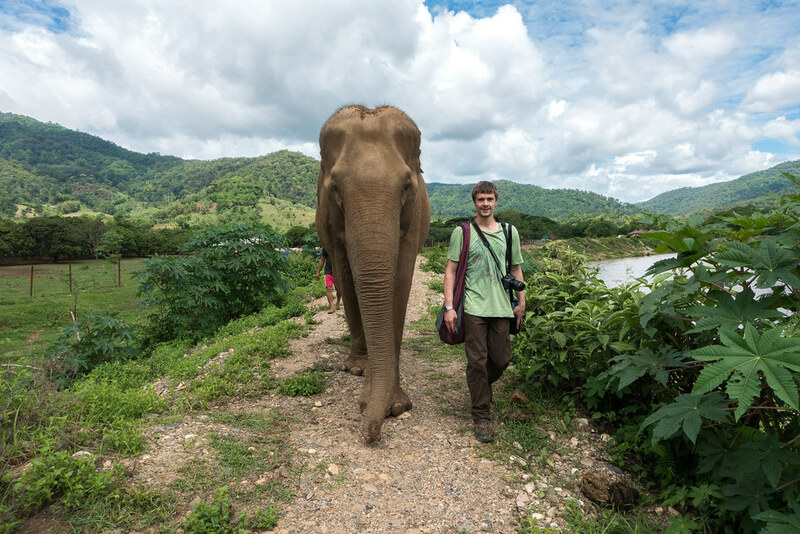 We began spotting elephants owned by other tourism companies, some with people on their backs (after watching the video, it felt especially sad to see). 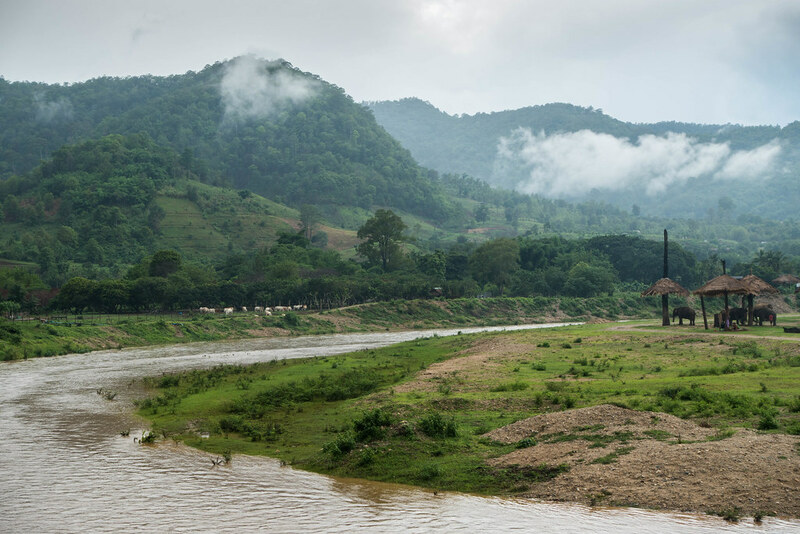 Eventually we pulled up beside a rustic toilet block and a wooden pavilion, which held our jungle survival kits: a large water bottle in a cross-body pouch and a cloth bag of elephant food each. Then we spotted the four elephants with whom we’d be spending the day. I’d only ever seen elephants from a distance before, in zoos, so seeing the giant creatures up close and unfettered felt extraordinary. 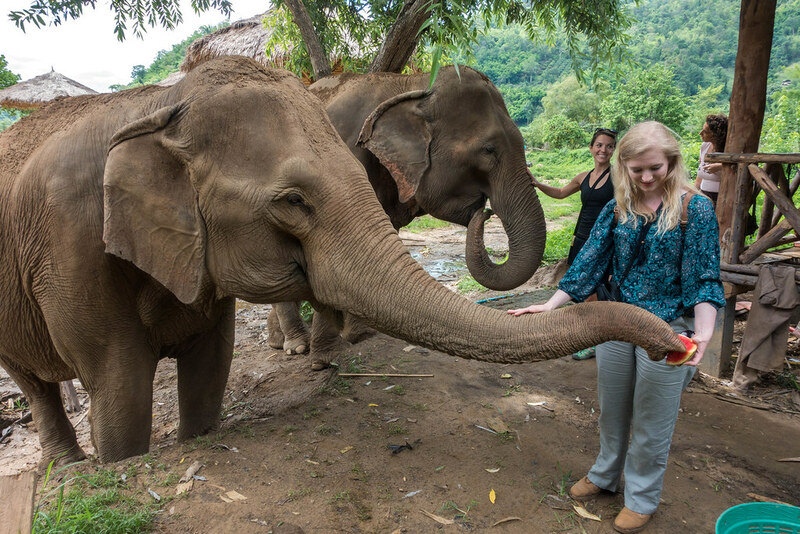 We fed them some fruit to gain their trust and I marvelled at how, despite their massive size and strength, their trunks lifted the fruit from our hands so deftly and gently. 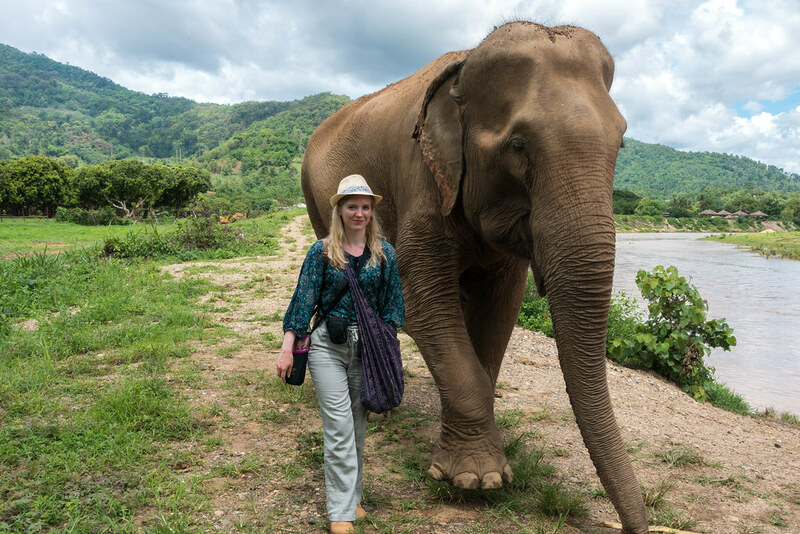 As I fed our elephant I carefully reached out to stroke her trunk and found her skin to be warm, rough and bristly – really like nothing I’d ever felt before. Next, we began our walk through the jungle. For this we were each assigned an elephant to lead, which we did by feeding them continuously. Steve and I were assigned to Meadow, an old lady elephant who was partially blind. That being the case, we were surprised at how lively and hungry she was! 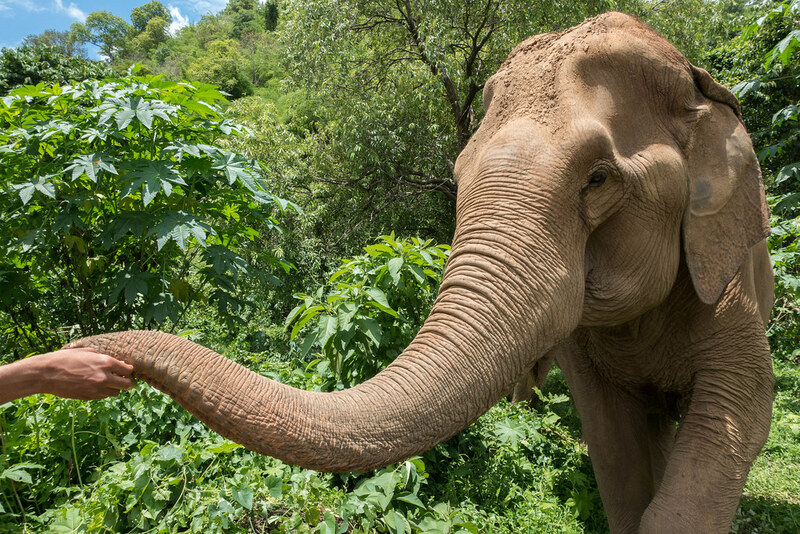 She and the others had voracious appetites and, as we walked, would begin poking our food bags with their trunks the minute the food stopped flowing. Walking in the shadows of these gentle giants, particularly in such a beautiful wild setting, felt wonderfully surreal. Often I’d turn around and find a huge, leathery, doe-eyed head just inches away from mine. It was a fun and enlightening experience. 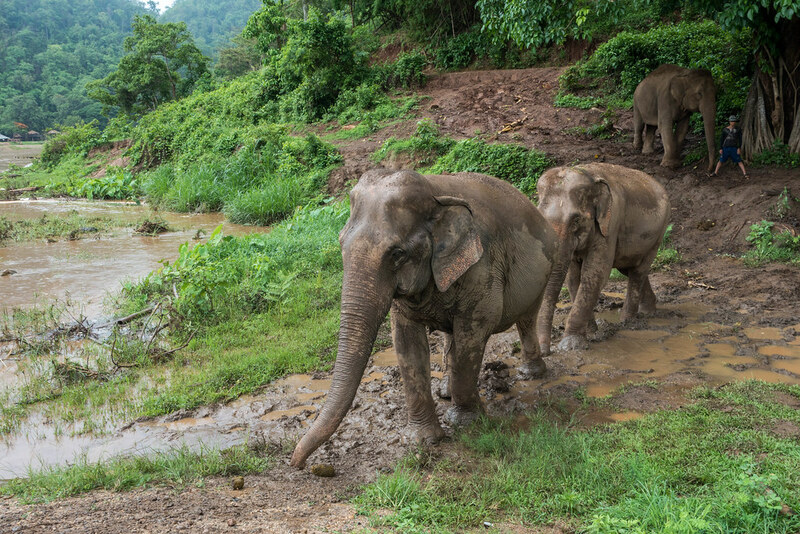 At one point we had to climb an extremely muddy bank and, while the elephants stepped up with ease, the human members of our party struggled – flimsy shoes got stuck and one man slipped right over! When we stopped to rest, it was heart-warming seeing the elephants interacting and doing elephanty things: itching themselves against tree trunks, breaking off branches with which to bat themselves, and appearing to talk to each other. A hilarious moment came when one elephant pulled down and snapped a branch off a tree, causing the rest of it to recoil and shower our party with water from the leaves! Reaching the river, we left the elephants behind as we went to have lunch at a wooden shack further along the riverbank. The vegetarian buffet provided was surprisingly good, and we ate sat around the shack’s edges, our feet dangling over the river rushing by below. Some people – wiser people – changed into swimming gear for going into the river with the elephants. I hadn’t brought any, so had to wade in fully clothed (thankfully, I had a change of clothes for afterwards). I also should have brought shoes that could be worn in water, as the river’s bottom was very rough with sharp plants and stones. The rain began the moment we began walking towards the river, transforming it into a gushing torrent of brown water. The current was so strong that it was a struggle to even keep upright! But if anything, the storm made the experience feel all the more crazy and funny. 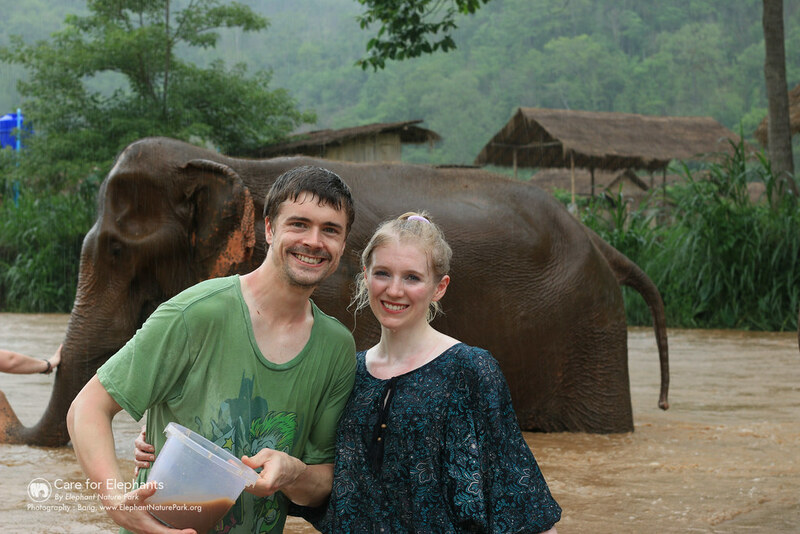 We were given buckets with which to throw water over the elephants, and amid the madness I accidentally threw it over another couple! I was mortified, but thankfully we were all so wet anyway they didn’t seem to mind! I hadn’t dared bring my camera into the river, so I was glad that ENP had provided a wonderful photographer to capture the moment for us. 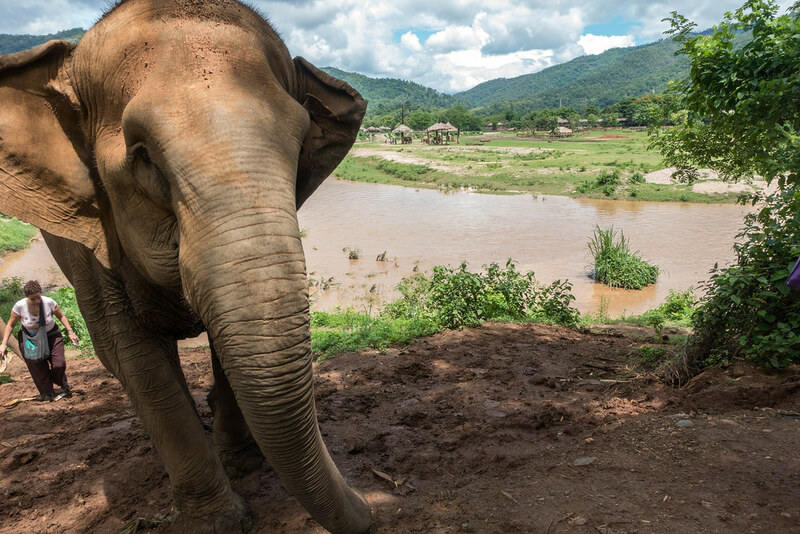 We emerged from the river drenched in muddy water, and dried off as best as we could before returning to where we began, once again leading the elephants by feeding them. 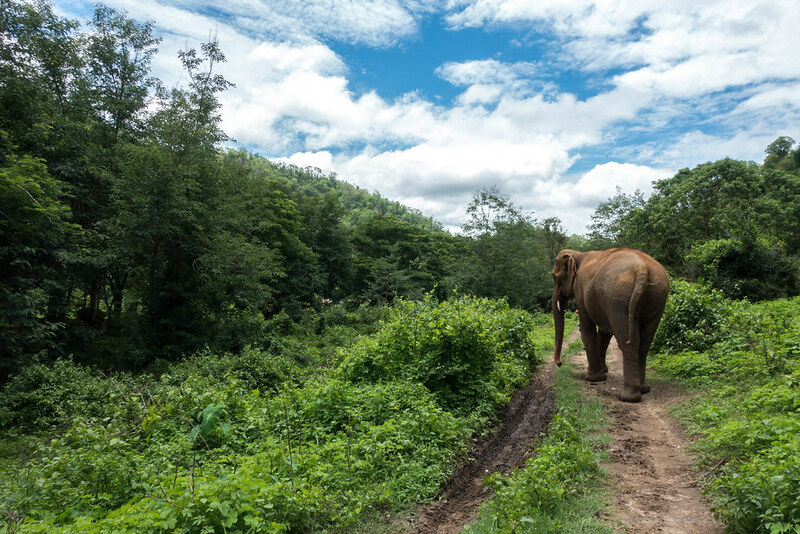 After saying goodbye to our elephants, we changed into our clean clothes and the minibus took us to Elephant Nature Park itself. Here, our guide took us to see an adorable baby elephant that was born just a month ago (mostly hiding between his mum and a nanny) and an elephant who could only stand on three of its legs due to one being damaged by previous ill treatment. 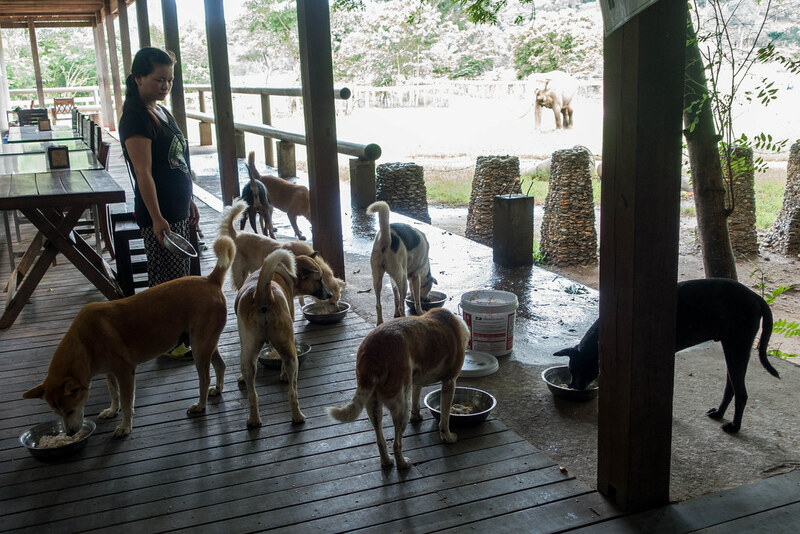 Before leaving we paid the remainder of our bill at the gift shop and had a drink in the café, surrounded by the many dogs the park has rescued. Signs posted around the place advertised individual dogs up for adoption. After the long drive back to Chiang Mai city we were more than ready for dinner. We’d wanted to go to fancy restaurant Ginger & Kafe, but found it all booked up when we arrived. The woman at the door sent us to its sister restaurant The House, which had the same menu but a much more laid-back vibe. 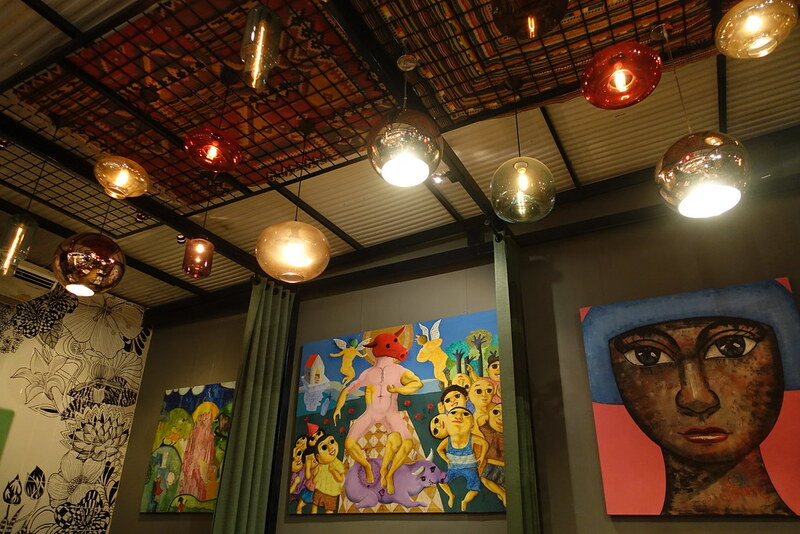 In place of Ginger & Kafe’s opulent décor and white tablecloths, The House is decorated with cute pastel checks and trendy wall murals. It wouldn’t look out of place in a trendy part of Edinburgh. Nevertheless, the food on the menu’s Thai section was authentically Thai. 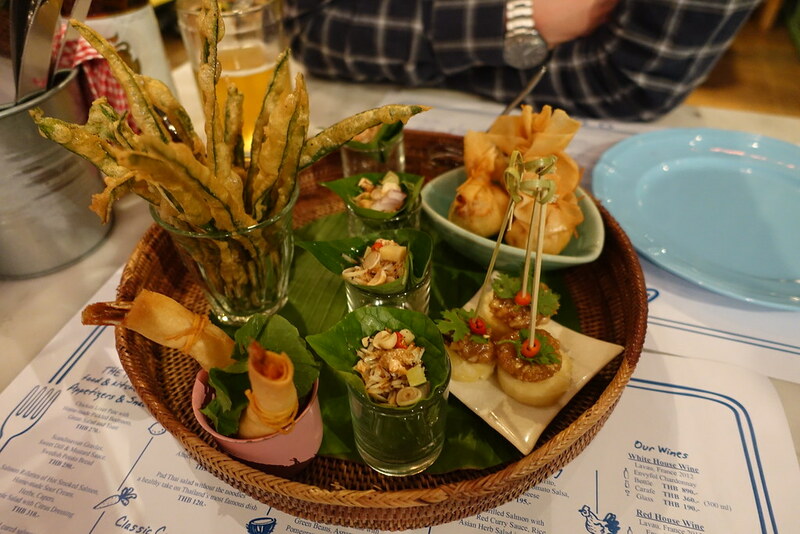 We started with a platter of exciting appetisers, all of them fun to eat and bursting with zingy flavours. For the main course I couldn’t resist ordering another khao soi, and this one was amazing – much larger and more refined than the first, boasting a lot more meat. 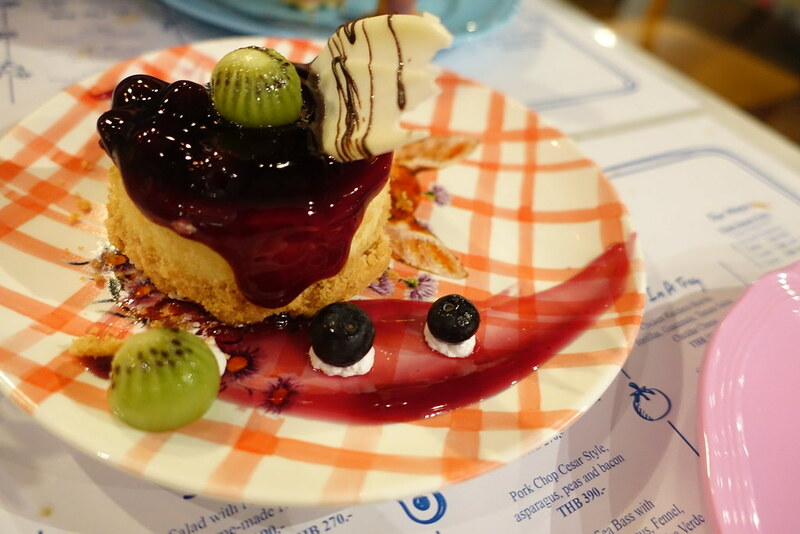 We were pretty full afterwards but still managed to share a cheesecake, which both appeared and tasted like it had been made fresh that day. Alongside this feast I enjoyed two original cocktails, strong and with just the right level of sweetness. 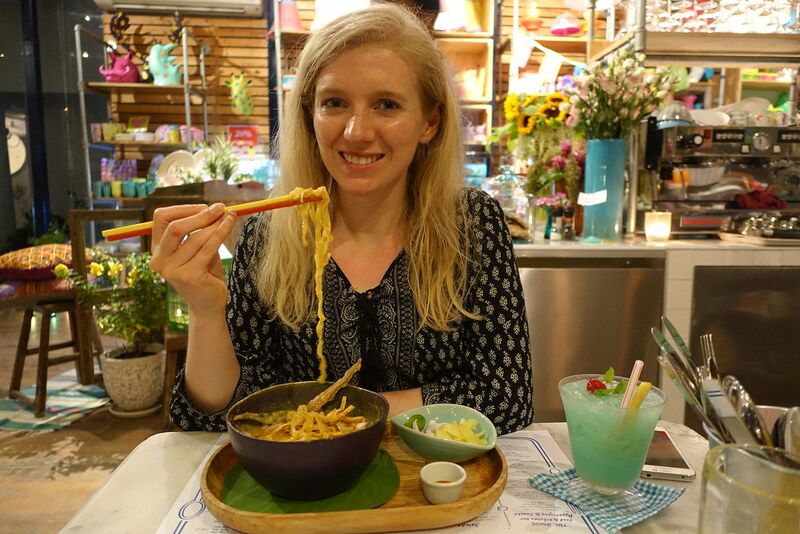 This gorgeous dinner was the perfect end to our short stay in Chiang Mai: a place I’ll always remember for its beautiful temples, delicious food and generous people – but perhaps most of all, its elephants! All text and photos (c) Juliet Langton, 2016. All rights reserved. Posted in Asia, Photography, TravelTagged Chiang Mai, Elephant Nature Park, elephants, Featured, Ginger & Kafe, Thailand, The HouseBookmark the permalink. 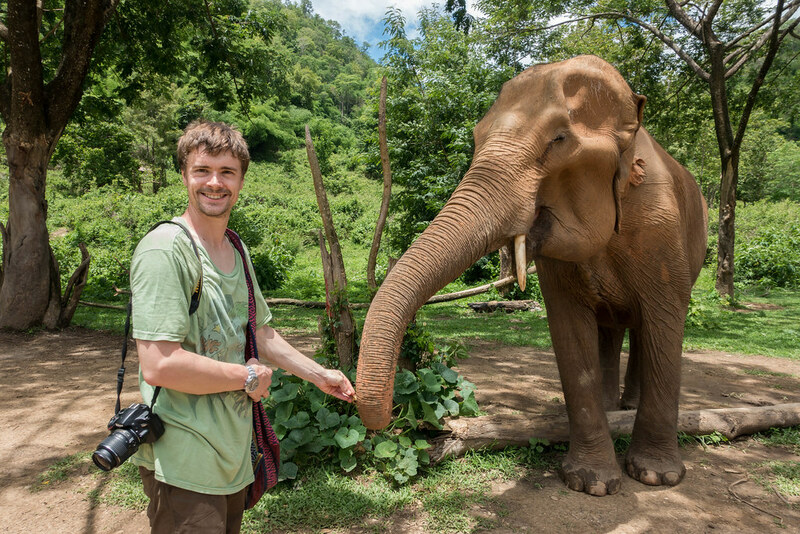 Yes it was surreal – and elephants are definitely very clever! Thank you for the narrative and pictures of your visit. I enjoyed it a great deal. I adore elephants and if I were able, I’d certainly go be there for a while. You allowed me this experience and I appreciate that greatly. Thank you for reading and for commenting Marilyn! I am so glad you enjoyed it.